Home » Poodles » Feeding Your Goldendoodle: What’s the Best Choice? But, I Heard Grain Free Was Bad? Wet, Dry, and How Much? How Much Should I Feed My Goldendoodle ? For a Goldendoodle, it is important to make sure that their food is something that is going to help their development, improve their health, and provide a high standard of living. While this mixed designer breed avoids many of the health issues that their purebred parents can inherit, there are still many issues to consider with your Goldendoodle. Skin and coat issues, heart health, and hip and joint issues are all dangers that a Goldendoodle can face, and their food can help alleviate these issues. This list will show you the best foods for your Goldendoodle. From puppy, to adult, to senior foods, every life stage of your dog requires a different food. Because Goldendoodles come in many different sizes, it is important to make sure that you get a food that meant for your Goldendoodle’s needs and weight. Take a look at the best foods for your Goldendoodle, and see which you think your dog may like the best. 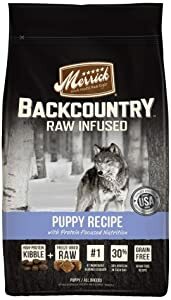 The Merrick Backcountry is a high protein food that uses pieces of raw food in order to boost immune systems in dogs. For an active dog like a Labradoodle puppy, you need a high protein food that will be able to keep up with their nutritional needs. This line is also an excellent choice do to the Lil Plates variety, which is for small breed dogs. Having both a large and small breed line of this line puts it near the top of the Labradoodle dietary choices. Made solely in America, Merrick has a basic line and a grain free line along with their high protein line. Depending on the allergies or sensitivities your Goldendoodle may have, picking different proteins could be important. The Salmon option is almost always safe, and the omega fatty acids in the food will also help bolster skin and coat health. With a non-shedding breed like a Goldendoodle, keeping a healthy coat is extremely important. They also have a big line of wet foods for pickier puppies. Their wet food and treats also do a great deal for putting them higher on the list, making some of the best of both. Instinct is a high protein, high energy dog food for growing puppies and active adults. With several different lines, including freeze dried raw kibble, frozen patties and kibbles that require thawing due to their ingredients and storage, and a few basic foods as well to top it all off. 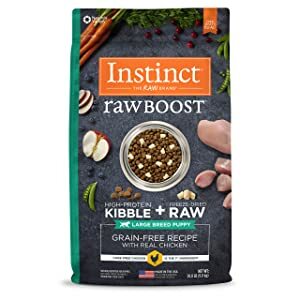 Instinct is a brand that focuses not on just feeding your dog, but creating a full meal for them by adding extras into the food, making it more balanced and healthy overall. For a Goldendoodle puppy, the sheer amount of options in this brand is a great first point, and the addition of extras on top of that make even the pickiest of puppies to get excited for mealtime. For smaller Goldendoodles, the frozen food is a popular choice due to the cost of feeding being lower, and for larger Goldendoodles the high protein and taste of their kibble will help provide the proper nutrition for growing. They push out a lot of the competition with the choices of add on: Raw kibble, toppers meant for a variety of health issues, freeze dried add ins that double as treats, wet foods, and even frozen food that can be added in after it thaws give a huge variety. 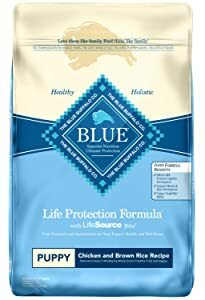 Blue Buffalo, besides being the biggest all natural dog food company in the world, has dozens of different formulas, lines, and protein choices along with wet food and treats. Their Life Protection formula is their first and foremost line, but if you want a grain free option, their Basics or Backcountry offer good choices. Many of their foods have chicken, however, so this brand does lose some points for possible sensitivities. For a Goldendoodle, the Backcountry is one of the better choices due to a higher protein content than some of their other lines, and all of the Backcountry is grain free, as well. There are a lot of choices, but almost every food in this line does contain chicken in some form, which is why it is not at the top of the list. For a high quality food that is easier and easier to find, though, it is still a great choice for a Goldendoodle Puppy. Their also have a huge selection of wet foods, and treats in almost every variety of soft and crunchy. 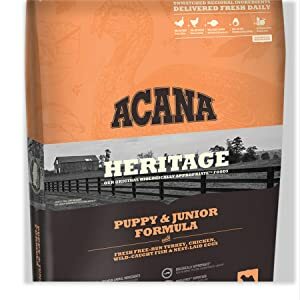 Acana dog food is one the highest quality foods on the market, due to their healthy sourcing, high standards, and demand for the freshest ingredients in their foods. Acana makes it onto the list with sheer quality over quantity of choices, and the choices they do offer are all exceptionally healthy choices. However, because they do not have a huge selection of puppy choices, they do end up a bit lower on the list. For a Goldendoodle puppy, the Acana is going to provide a high quality and high protein option, similar to the Merrick. They are higher quality food than the Merrick and Blue Buffalo, but they simply do not have as many choices for puppies than their competitors. Luckily, the good ingredients and lack of any filler or artificial ingredients cause the chances of Acana failing to satisfy and please a Goldendoodle puppy to be low. While they also take a hit for not offering any wet food, their training treats are phenomenal even for the pickiest of puppies. 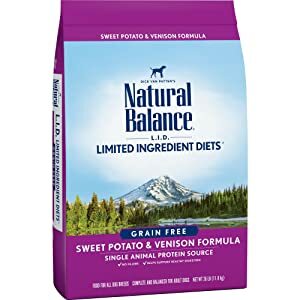 The Natural Balance line is an excellent line for pet parents who like to vary their dog’s diet from time to time. With food that suits all life stages, Natural Balance is easy to pick and stay on for a long time. Like many of the top foods on this list, it has both large and small breed varieties, but also has multiple options for dogs who need to lose weight. Their low calorie and aptly named “Fat Dog” make great choices for Goldendoodles who have put on too much weight. For a Goldendoodle, you may wonder what protein is the best. The truth is, different Goldendoodles and different lineages may have allergies or sensitivities to foods, so there is no best protein or food for all Goldendoodles. Depending on what your Goldendoodle is allergic to, different food choices will have to be made. The reason Natural Balance is high up on the list is their massive variety in choices for both large and small breed dogs. Most of their foods also have either potato or sweet potato, which are good non-grain options in many dog foods, putting this food near the top of the list. They have wet food as well, and a massive line of treats for everyday use or training. While not as well known as some of the other higher end dog foods, Solid Gold is a fantastic choice for adult Goldendoodles. With a smaller, single line of foods, they do not offer as much variety as some brands, but this also allows them to focus more intently on the formulas they do offer. Instead of an all life stages formula, they offer more fine tuned formulas for a dog’s specific age and size. Their small breed line is one of the best small breed foods available, both in content and quality. For a Goldendoodle, a food that supports their coat throughout their life is important. Solid Gold’s high quality ingredients offer the omega fatty acids and nutrients that are vital to a dog’s wellbeing, especially for lower or no shed breeds like the Goldendoodle. 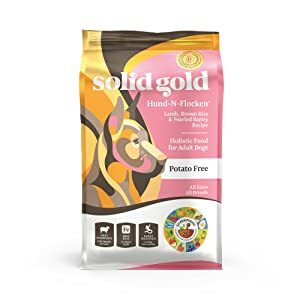 The higher quality ingredients and nutrient dense kibble also cause less trips to the bathroom, as stated in Solid Gold’s slogan: The Proof Is In The Poop! They also offer a good line of wet food, but not as many treats as some foods. They do make up for this with a wide line of add ins and supplements for many different health issues. 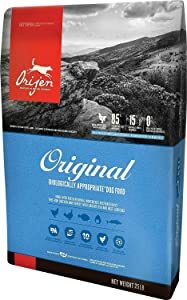 Orijen dog food is considered to be one of the highest quality dog foods on the market, and for good reason. With exceptional ingredients, higher quality of freshness and production, and ingredient sources that are shown directly on the bag, it has earned that title for itself. Just not beginning to expand out of online retailers and boutique stores, Orijen can be a bit tougher to find, but worth every kibble when you get ahold of it. For a Goldendoodle, Orijin offers a high protein food that is meant for those active, working Goldendoodles that need the extra boost to get through a full day. While they do have a reduced calorie option for less active dogs, they still have a high protein content that requires plenty of water to keep kidneys healthy and activity to put all that extra energy to good use. On top of that, it is a highly palatable food, the kibble even used as treats for some dogs with caloric stipulations. They do not offer any wet foods, but their freeze dried treats are one of the best for picky dogs or dogs with allergies. While technically another one of Merrick’s lines, it exists as a standalone brand rather than just a variation of their typical formulas. With less focus on raw diet and probiotics, Whole Earth Farms focuses more on delivering a more simple dog food. 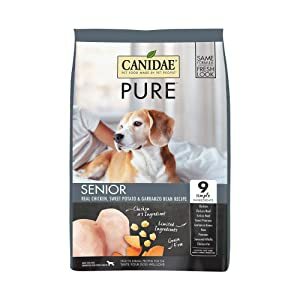 Without a lot of the extras that some all natural and high end dog foods offer, this is an excellent choice for those who do not want to pay as much, or are not sure about all natural foods and want a good stepping in point. For a Goldendoodle, the choice of different proteins in both a normal and small breed line is an appealing draw. The add to the appeal, having a food that does not contain many of the extras of other all natural foods also removes many of the things than can cause digestive issues, or make a dog decide they do not like a food. This also causes it to not be as high quality as many of the other choices, but it is by no means a bad food, landing it on the list. They do not offer any treats, but they have a good line of wet food for most Goldendoodles. Canidae makes their foods specifically for any life stage and for any size dog, selling towards households that have several dogs. They also have grain free and high protein lines, all of which are all natural and very high quality. Their expansion in the past few years has allowed them to be found in many new places both in stores and online, and they have always offered extremely good dog food with almost no fillers and no artificial ingredients. For a household with several different Goldendoodles, either in size, age, or needs, Canidae provides an excellent answer to all of those issues. Being specifically made for any age dog, their lines shine when a dog is in their senior stages. Adding a new puppy or adopting an older dog is no issue when feeding this food, as their massive sized bags and high quality ingredients offer proper nutrition for any age or size dog, putting it towards the top of the list for senior Goldendoodles. Canidae also offers many formulas for wet food, but not as many treats as other main lines. 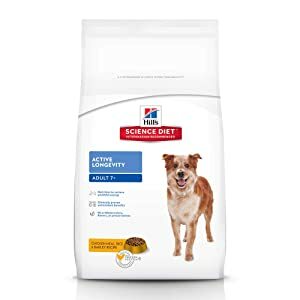 The most popular choice by veterinarians, Science Diet is a food backed by hundreds of clinical trials, thousands of hours of vet research, and tens of thousands of bags of dog food sold by the company over their long lifespan. Although some critics of the food note that it is not a grain free diet, and many of the ingredients coming from synthesized places, there is no doubt that the quality of the food is high. While the ingredients themselves are not as high quality as some of the others, the levels of minerals and vitamins are perfect. For a Goldendoodle, Science Diet can be a simple, easy food to pick. It is palatable to most dogs, has everything from puppy to senior, and offers large and small breed varieties. Like the Blue Buffalo, most of the foods contain chicken, but there are a few lamb options as well. If your Goldendoodle is not as active as most dogs, or you want a senior food that’s scientifically proven to provide a high standard of nutrition, Science Diet is the right choice. They also make sure to include increased levels of glucosamine and chondroitin, which are the two main substances needed for healthy joints. Their new line, Bioactive Recipe, is actually proven to turn back age related issues, such as dementia, in many dogs. While a lesser known dog food, Wellness offers quite a few different choices when it comes to senior dog food. 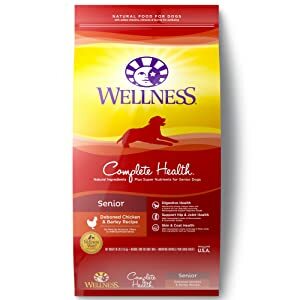 Their core line offers high protein options, and what was previous Spot’s Stew, now called Wellness Complete Health, is a great all natural dog food without too many extra add in or complications. With many single protein choices as well as some varied options, Wellness also provides a higher quality of dog food than many of the competitors. For a senior Goldendoodle that may still be more active, the Wellness Core is the choice to make of the lines. Higher protein means more energy for playtime, and it makes sure to still offer higher glucosamine and chondroitin to make sure those playtimes stay safe. Their normal line is more suited for Goldendoodles that have gotten a bit slower in their old age, and need less protein and fat in order to keep them from gaining weight. They also offer many quality wet foods, as well as both soft and crunchy treats for dogs who prefer different treats. The only thing to avoid is their Vegan formula, as vegan diets are proven to drastically reduce a dog’s lifespan. The Nutro brand of dog food carries a few different lines, but their standard Nutro line is their best. Having both large breed and small breed varieties already makes it an excellent choice for Goldendoodles of all sizes. Their different proteins and options make it an easy food to transition from puppy all the way to senior in, giving your Goldendoodle options as they grow. Their senior formulas have increased levels of glucosamine and chondroitin in them, making them a good choice. Although there was a shortage of it recently, they have upped production and are now able to sell to many new stores and online. This food is much easier to find than some of the others, making it a popular choice for people who travel or live far from pet stores and can only make seldom trips. 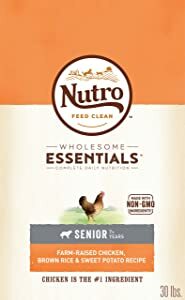 Nutro also have excellent quality control on all of their foods, with almost no issues or recalls of any kind, so it is also a safe choice for those worried about contaminants. They do very well with their wet foods, but fall behind just a bit with their treats. Due to the shortages they faced in some parts of the country, some pet parents went elsewhere to find a good food, but Nutro remains a very good choice. 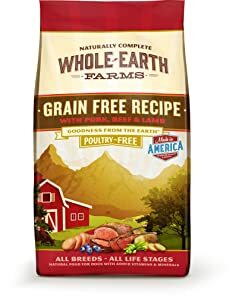 While this has been a very popular rumor and study going around, there is no solid proof that grain free dog food is bad. A study went around recently, denouncing grain free dog food as a cause of heart issues in dogs. However, while this study was published, it was not proven to be true due to a few issues. The first is that the study was done solely on Golden Retrievers. While they are the Golden half of the Goldendoodle, Goldens have a severe predisposition to heart related issues already, skewing the results by having the breed bias. The second is that the FDA put out a statement saying that even though the study was published, there was not enough solid evidence to promote it as fact. Lastly, the main issue that was linked to heart issues was a lack of taurine – an amino acid found only in meat sources. Having grains would do nothing to add to the taurine content, as it is not found in any plant source, meaning that the existence of grains would do nothing to mitigate any lack of taurine. This being said, a grain free food is not mandatory for a healthy Goldendoodle. If your Goldendoodle has no issues or allergies to grains like brown rice, then picking an option with grains is not a mistake. For many active dogs, picking a higher protein food that is grain free can be a smart choice, but that is not as vital for a dog who may be lowered energy. Every dog is an individual, so shopping through a few on this list is never a poor choice. One of the most common questions about feeding any dog, Goldendoodles included, is if wet or dry food is better. While many people worry about their dog getting enough with just one or the other, there is answer to this question. While every dog does have their own needs, dry food is typically more important that wet food in a dog’s diet. The compact, high nutrition kibble bites that also crunch against teeth to clean plaque are a better choice in most cases. Wet food can be added as well, more as a topper or to entice a picky dog to eat. The only time that wet food is typically better than dry food is for dogs with missing or damaged teeth, dogs with very specific needs that cannot be met with kibble, or puppies under the age of eight weeks who cannot handle kibble yet. There is nothing wrong with adding wet food if you want, as long as you are not overfeeding your dog. This leads into the second most asked question: How much do I feed my dog? This question is even easier, as every bag of dog food will always offer feeding guidelines right on the side or back of the bag. Higher quality foods will require less food, as their kibble is more nutrient dense and provides more without needing to have as much eaten. This is important to keep in mind for comparing prices and weights of dog food. Not every pound of dog food is made the same – and the same goes for the canned food. which naturally carries less nutrition due to a very high water content. In order to know if your dog is at a healthy weight, you should be able to feel their ribs easily and see the shape and outline of them without being able to see the individual ribs. A vet can help you decide whether or not your dog is overweight, as well. While every food has a different requirement, try to adjust it for your own dog’s personal needs. This chart should help you as a basic guideline for how much to feed your goldendoodle per ten pounds. Hopefully, with this guide you will be able to begin your search for the right dog food more easily, and find something that makes both you and your Goldendoodle happy. Make sure to talk to a vet for any nutrition or allergy needs, as well as a dog nutritionist who may be able to guide you, as well.